NASA's Juno spacecraft has spotted giant cyclones swirling at Jupiter's north and south poles. That's just one of the unexpected and puzzling findings being reported by the Juno science team. Juno arrived at Jupiter last summer. It's the first spacecraft to get a close-up look at the planet's poles. It's in an orbit that takes it skimming close to the cloud tops of the gas giant once every 53 days. After each close pass, the spacecraft sends a trove of data back to Earth. Scientists weren't expecting to see cyclones at the poles. "You point a camera at terra incognita on Jupiter, and 'surprise!' 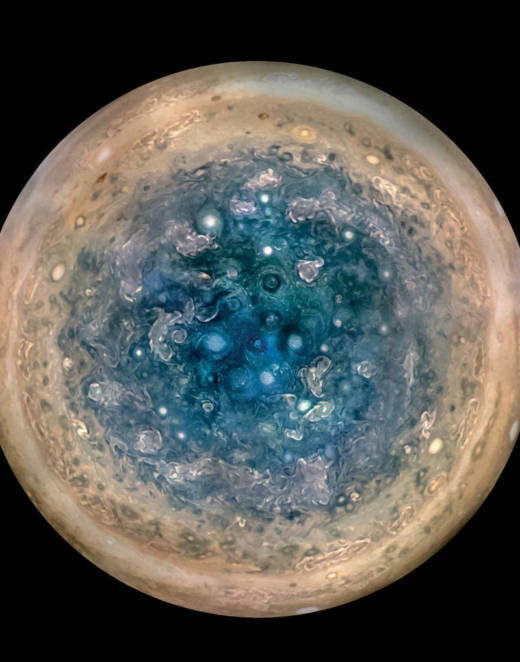 you get a surprise," says Cornell University's Jonathan Lunine, director of the Cornell Center for Astrophysics and Planetary Science and a member of the Juno science team. Ultimately, scientists will want to understand how these cyclones change over time and whether they form differently in the north and south poles. "But for now, just to sit back and stare at these images is just a delight to the eye," Lunine says. The Juno team met earlier this week at the Southwest Research Institute in San Antonio, where scientists discussed the latest data to come back from the spacecraft. (The results from Juno's earliest passes is in the journal Science and in a special collection in Geophysical Research Letters.) "We're all jumping up and down with huge excitement," says team member Fran Bagenal, professor of astrophysical and planetary sciences at the University of Colorado, Boulder. "The results are really quite fabulous," she says. "And they're fabulous because they're not what we expected. If we just saw what we expected, it would be 'ho hum, ho hum, that's good but, you know,' ... Seeing puzzles and mysteries and getting us all excited wondering what we are seeing is more exciting." Some of those puzzles and mysteries are pretty obscure. For example, there's some startling new data about the spectacular auroras at the poles of Jupiter — which are like the Northern Lights on Earth but much more dazzling. 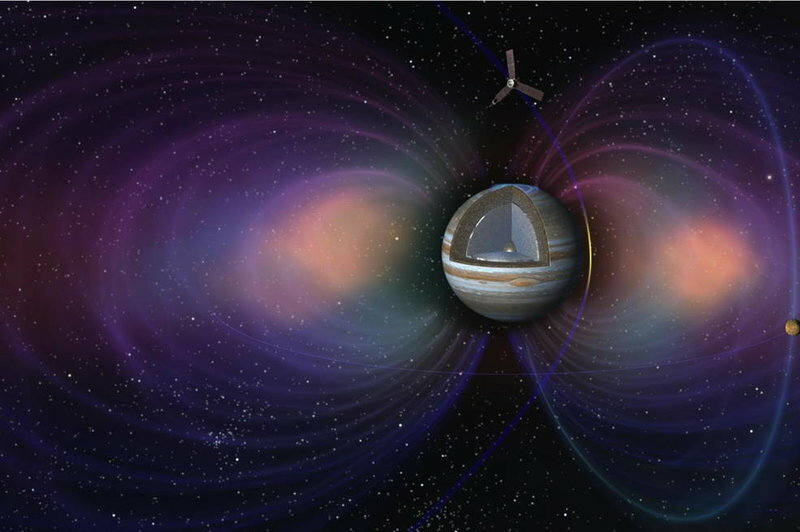 These auroras are caused by energetic particles streaming along Jupiter's magnetic field lines, and Bagenal says there should be strong electrical currents associated with all those streaming particles. "But we haven't detected the magnetic field perturbation associated with them," she says, a detail perhaps important only to people who've spent their entire lives studying Jupiter. Another puzzle that Juno is supposed to help solve is whether Jupiter, a gas giant, has a solid core. "The early data are suggesting the presence of a core," Lunine says. "But not a discreet core. It seems that it's fuzzy." He says more data should help provide a more precise understanding than fuzzy. Another surprise from Juno is the concentration of ammonia in Jupiter's atmosphere. Scientists thought ammonia was most likely distributed evenly throughout the atmosphere. "That's not what Juno is showing us," Lunine says. The data show there's more ammonia near the equator than there is at other latitudes. Juno is expected to make about two dozen more close passes over Jupiter's poles, so there'll likely be more puzzles to come.